It’s hot. The last week of July kind of hot. Wednesday the 23rd I had 5 folks from the Villages retirement community onboard and there wasn’t a breeze blowing when we left Cedar Key at 9am. Clear sky and smooth water as far as you could see. As I waited on my guests to arrive at the dock I looked out to the channel and saw a lot of bait moving along with the incoming current and many dolphins feeding there. I hoped the shallow flats and oyster bars would have many bait fish swirling around as well. My folks showed up and we headed straight over to Seahorse Key and anchored off an oyster bar tucked up next to the northwest edge of the key. The night before there was hardly any moon out, so the fish didn’t stay out all night eating. There wasn’t enough light. That meant the fish would be eating all morning long. Plus we had an incoming tide bringing in lots of hungry fish. And I mean LOTS. As we stood in the pontoon boat and looked out over the water we could see several schools of bait churning up the slick surface. I had culled out 2 dozen of the largest shrimp I brought along to lay on the bottom along the edge of the oysters and hope they would excite a few redfish into gulping them down. I couldn’t get the rods out fast enough. Imagine, I’m handing a rod to one of the fishermen and then bait the hook and then grab another rod and before I can hand it over the 1st rod is bending and line peeling off, and fish swirling fever has got us. I finally handed out all the rods to my 5 fishermen (one of the fishermen was a lady) while netting and measuring and taking pictures of the many redfish we caught there. The lady’s name was Donna. The only other time she had been out on a boat was a trip on a gambling cruise. She had never held a fishing rod. You guessed it. She caught the biggest and best of all the fish that trip. 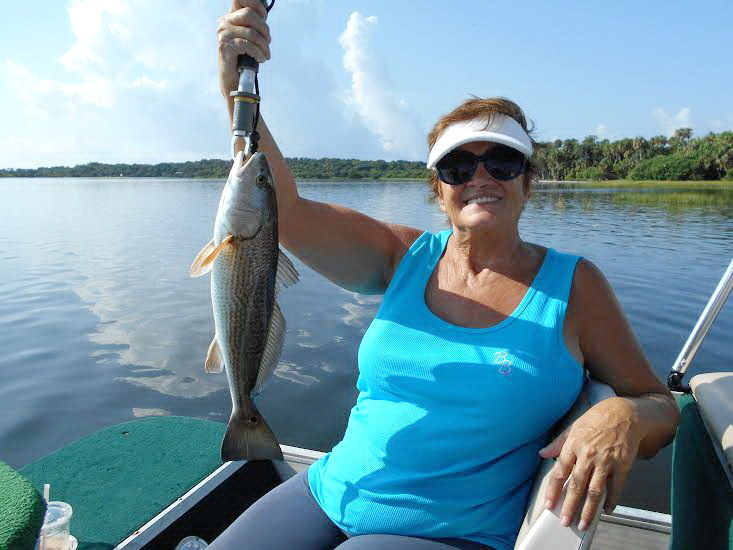 Here is a picture of Donna with her 1st redfish and a pic of some of the fish I cleaned back at the dock. 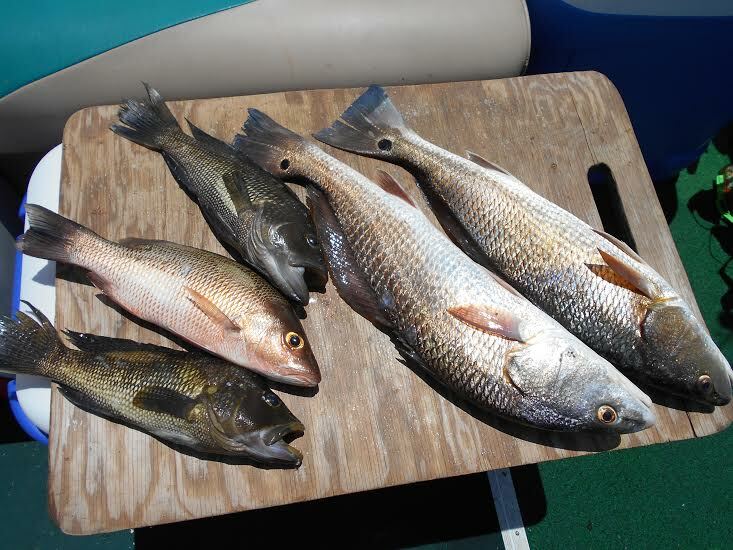 On the cleaning board were 2 black sea bass, (sweet white meat) and a mangrove snapper, (excellent table fare) and 2 redfish to round out some real good fresh fish for dinner that evening. Folks, there were fish everywhere and the water was a beautiful green and clear to 4-5 ft. I’m glad I have a Bimini top to provide a little shade during these hot months of summer. Shade and a little breeze have a nice cooling effect. I was so busy this trip I didn’t have a chance to fish myself. Next trip I will.